My oldest is very artistic. My middle child loves being outside and in nature (and wild). And as it turns out, this baby of mine loves sports. I suppose we are about to become one though. 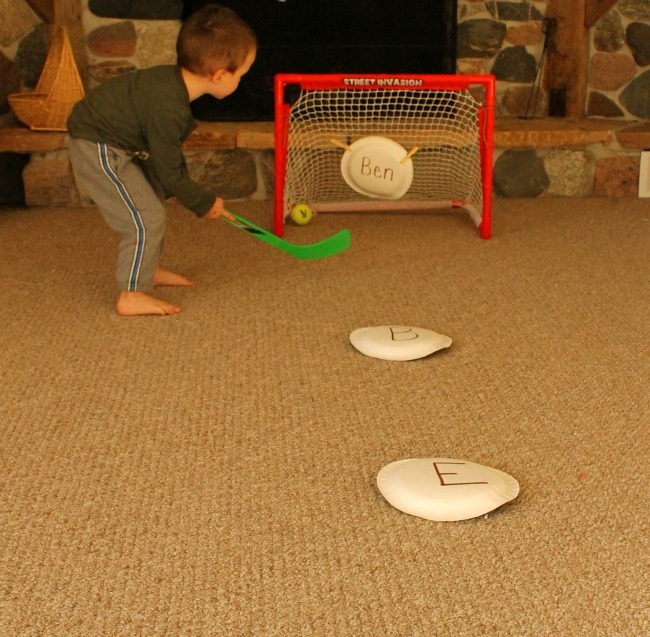 Ben is just barely 3 and already has the meanest slap shot I have ever been witnessed to while playing goalie in the basement. A role I play quite often. Hockey is certainly his favourite sport right now, but he also loves golf, volleyball, basketball, and pretty much any other sport he has ever seen for even a split second. 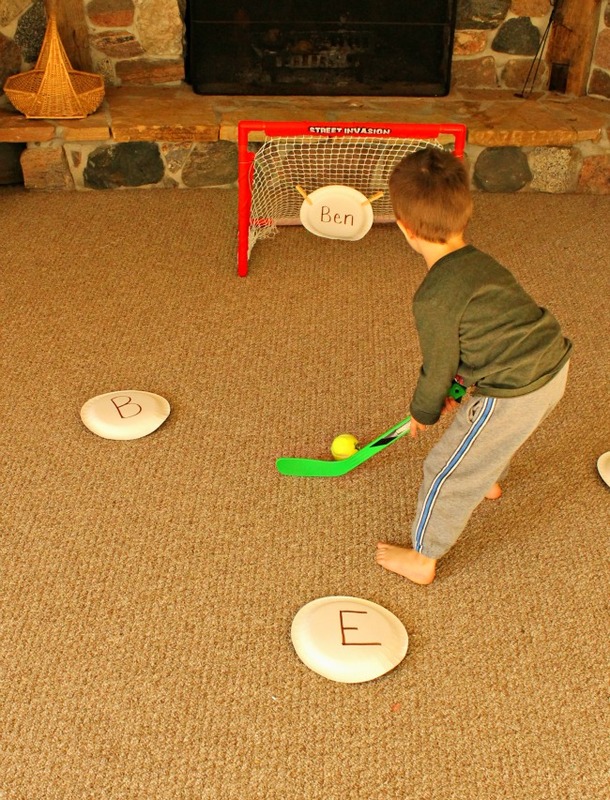 Since playing hockey is what Ben chooses to do almost 90% of his time, I thought I might be able to sneak in a little name practice too. And so I bring you – name hockey. 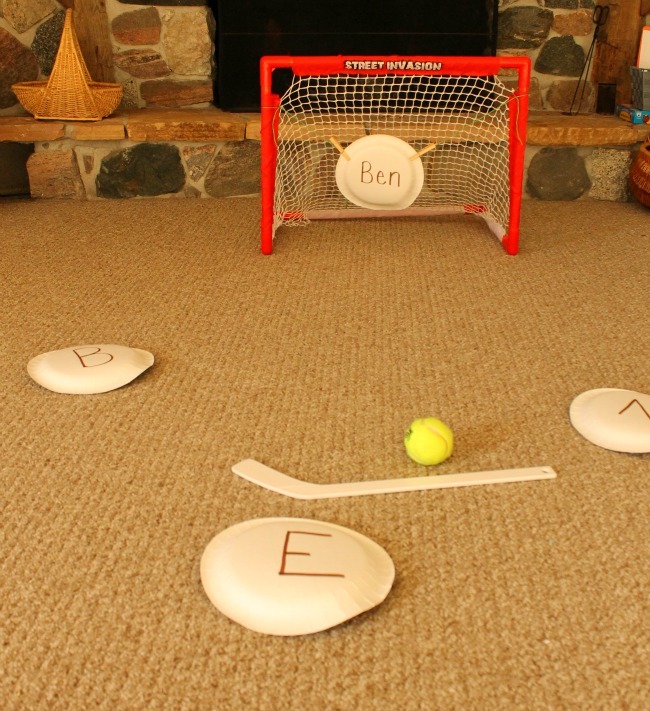 I simply popped up a paper plate labelled “Ben” in the hockey net. I added two small pieces of yarn and tied two clothespins to the end so the paper plate could easily be clipped on and off. Then I labelled three other paper plates with his name letters: ‘B’, ‘E’, and ‘N’. When I teach little ones their names I write it in proper form ‘Ben’, but when I am introducing the letters separate I use capitals. This is also a great chance for little ones to practice matching their upper and lower case letters. I didn’t really have too much of a plan as we got started, I just wanted Ben to have a chance to play with and see his name letters. 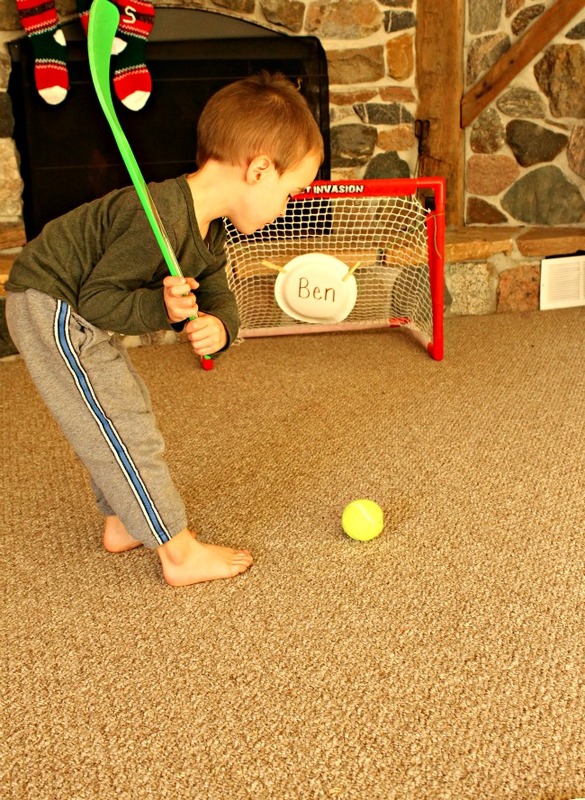 He started by simply shooting the ball at the paper plate goalie named Ben. 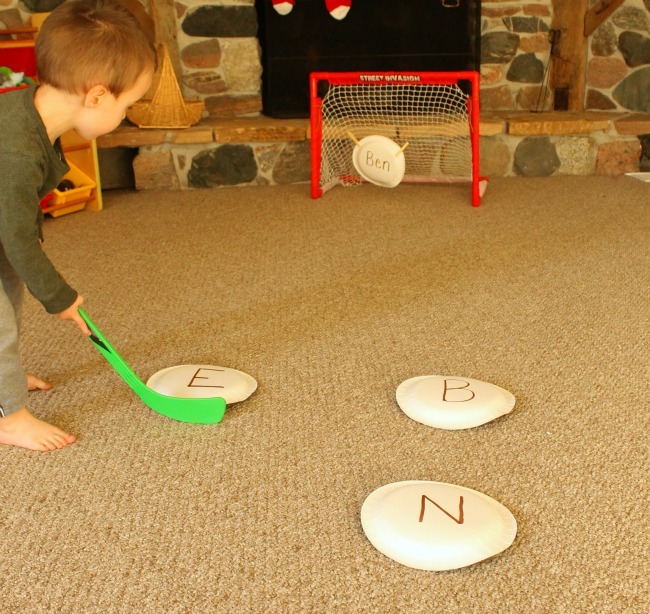 Then he practiced some stick handling around the loose paper plates before taking a shot on the net. This was a great chance for me to be the announcer, introducing Ben to these letters. The best part is that Ben doesn’t even blink when I play the enthusiastic announcer. Just a normal morning at home with Mom. After awhile Ben started shooting the paper plate capital letters into the net as well. Turns out paper plates slide pretty well, even on carpet. There is no right or wrong way to play of course. 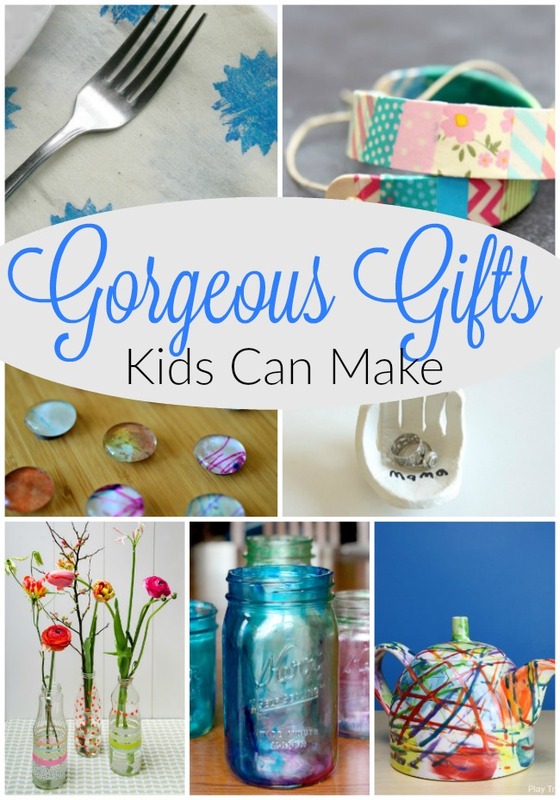 This activity can be easily adapted to meet any little ones current skill level. 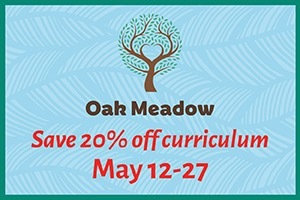 Maybe your little one is working on numbers, or sight words? 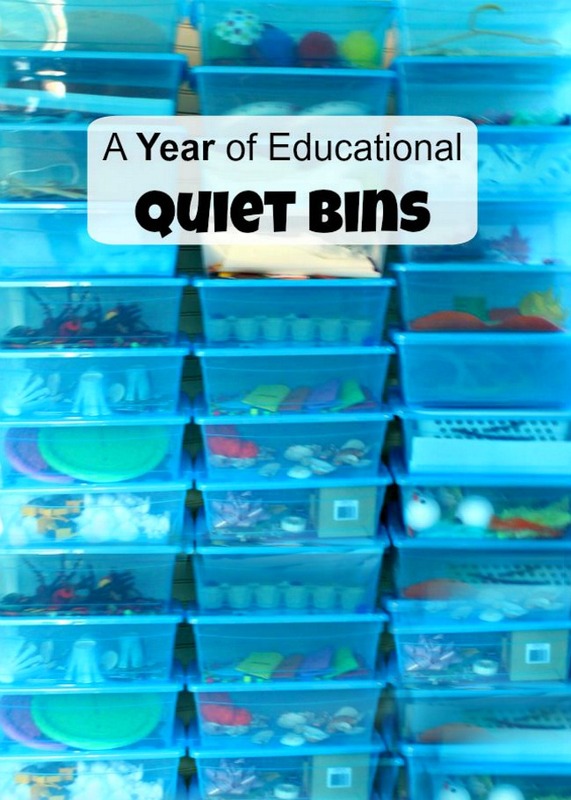 Those would be great with this activity too. I love finding ways to make introducing the alphabet letters fun. Since Ben is so young we are still really focusing on all of that great oral language development. Giving him a super strong foundation for literacy. We do a lot of rhyming, singing, reading, and story telling. Over the next year or so we will be adding in more and more letter play. But as I always say (in my own head every day too …) there is no rush. Hope you are having a lovely day friends! That’s a pretty cool new way of teaching your child how to spell their name. I have to try it at home with my 2 year old.